"I made this sandwich once, and have been hooked ever since! Once you get a rhythm, this is a quick and easy dinner. And tastes great hot or cold." This was an excellent recipe. 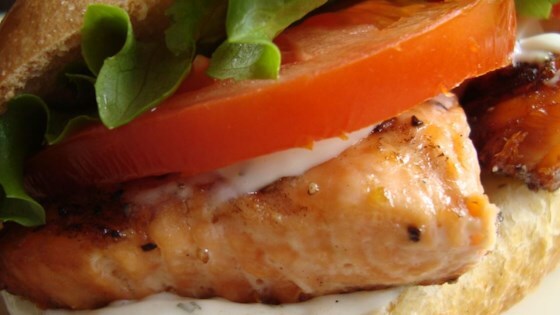 I made one small change - I applied the sauce to the salmon BEFORE grilling, and also used it as suggested on the sandwich itself. Yum! Every time I make this it's a huge hit! It's soo easy to make and I wouldn't change a thing!